The 5th Annual Small Business BC business plan competition just concluded. It sounds like the event was a huge success this year with over 170 qualified applicants, great finalists, and a great winning business plan. Meet the winners. Danita Harty, over at fundfindr.tv, wrote a nice post about the event. fundfinder.tv is also featuring a video overview of the event that includes interviews with the judges and participants - I especially like the bit that starts at about 4:36. Winner: James Shearer from Peragro Media Inc.
Forbes.com will be kicking off their Boost Your Business competition April 2nd. The prize - a $100,000 cash infusion for your business. So dust off your business plan and get ready to convince Forbes.com that your business, above all others, can do the most with that fat pile of money. This is the 2nd year for the competition. Last year, nearly 1,000 candidates fought it out for the cash. Five finalists presented their business plans to a panel of judges and the lucky winner walked away with a check for $100,000. I'd love to send a plan produced with some help from Business Plan Pro to this competition in April so convince me that you've got a chance of winning the Forbes.com competition in the comments section of this post and I'll give you a free copy of Business Plan Pro Premier. 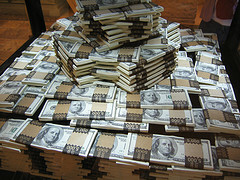 Stay tuned to Forbes.com and the Boost Your Business website for details regarding the business plan submission process. McKinsey & Company is launching a virtual business plan competition in Second Life. Be part of the first truly global business-building contest ever held in the virtual world! The Virtual Venture Competition is your chance to turn your innovative ideas into successful business operations in Second Life. The competition is open to students and young professionals no more than 32 years old, and first prize is US$20,000 in training and career counseling. Teams get 45 days to build a business, but there’s no fixed start or end date, you can apparently jump in at any time. Only a limited number of teams will receive initial funding, however. It should be really interesting to see how this plays out. This is the 1st business plan competition of this type than I'm aware of. If you're a member of the Second Life community, comment here and let us know how this develops. The winners of the 2007 Rhode Island Business Plan Competition were announced yesterday. PROVIDENCE – (May 1, 2007) – A local company that provides software which turns GPS-enabled cell phones into personal security devices on college campuses and a student team from Brown University that is creating a company to help employers lower their health care costs have been named the winners of the 2007 Rhode Island Business Plan Competition. Campus Guardian Corporation, led by Michael Glier of Jamestown, RI, whose software turns GPS-enabled cell phones into personal security devices that automatically notify college and university security in emergency situations, was named the winner in the entrepreneur track. Providence Health Solutions, LLC, co-founded by Brown University medical students Brad Weinberg and Rajiv Kumar, a workplace wellness program that relies on a peer approach and exercise competitions to motivate behavior change and weight loss, was the student track winner. The competition winners each receive prizes valued at $62,500. The competition attracted more that 40 business plans from seven states. What's up with this? Good ventures, represented by not-so-good plans. You read the plan first, then meet the people, listen to their pitch, and ask questions. The four ventures I dealt with were the best group of four ventures I've ever dealt with. All four had solid ventures, believable offerings, defensible positioning, interesting markets, and competent teams. Three of the four teams presented not-so-good plans that misrepresented the quality of their businesses. Problems began with long winding texts sprinkled with grammatical errors. Some had financial projections that left out key elements of cash flow and working capital. They had no business charts. That's a shame. The good news is that what they had to present was so much better than what they showed in their plan. The bad news is that the plans undervalued the ventures. While it is true that the management team, the business offering, and the market potential are much more important than the quality of the plan, it's also true that a business plan is relatively easy to do well. Why, with such a strong venture, would they not take the care to reread and edit their plans? That isn't hard. I think it's a matter of optimizing. Why not do your best? If you're going to a graduate level intercollegiate and international venture competition, ask somebody to edit the plan for simple practical writing. Make sure your projected income and balance link up correctly with the cash flow, and that the cash flow understands working capital. Use business charts to illustrate the main numbers. On this one I get to think like entrepreneur and grandfather at the same time, because last week's $50K first prize winner at the University of Oregon Intercollegiate International New Venture Competition was a grandfather's recipe for cockroach bait. This was a surprise. It's cockroach bait, not a website, not medical, not electronics, and not even new. Mullis Enterprises, the University of Georgia entry, was also a last-minute entry, invited to join the 19 other finalists only after the 20th finalist dropped out shortly before the finals. 10 startup ideas from the TechStars competition (300 applicants) were selected this week. The selected startups will move to Boulder Colorado for a 3 month, mentor backed, startup kickstart. TechStars provides seed capital, experts, infrastructure, and access for a 5% equity position. Is all of that worth 5%? Does an environment like this increase the chances of startup success? Is it limiting in any way? 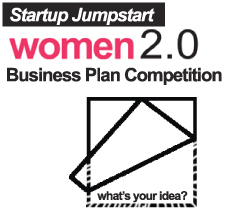 Women 2.0 has a great concept for a business plan competition: the business plan must fit on a 5x5 napkin. First, this contest forces contestants to focus on their elevator pitch and executive summary which are arguably the most important parts of a business plan. Requiring a focus on the core of what makes a venture remarkable and how it is going to achieve its goals ensures that contestants aren't distracted by the rest of the business plan. Too often, the elevator pitch/executive summary are not given the attention that they require and don't focus on grabbing the reader and convincing them within the first few sentences that the rest of the plan is worth reading. This contest won't let that happen. Second, there are huge opportunities to be creative with this contest. I'm sure some contestants will just fill the 5x5 space with as much text as they can fit, but the real stand-outs will be the submissions that are creative with the space allowed. How will your napkin stand out from all the other submissions?